Kedaar started to stand up using support from the past 2 ,3 days. 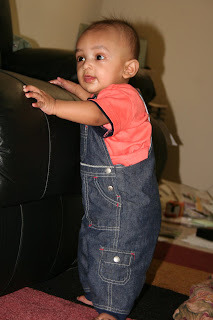 He is able to put his hands on sofa and eventually stand up. He also tries to hold our hands or rocker or pillow or anything possible to support himself in standing position.He is also crawling super fast these days. He just likes to explore everything. We ordered the little playzone gate with 4 extensions that creates around 53 square feet space for Kedaar to play. We explored several other gates but thought this would be a good thing for him as it is colorful and has some toys to play as well. We are eagerly waiting for its arrival. 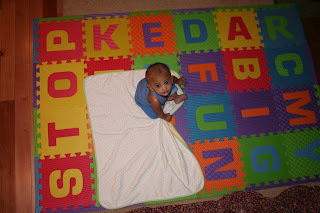 We bought an alphabetical foam playmat today. We created some space for Kedaar in our great room to crawl using this. This is soft and nice. Kedaar could crawl easily on this and he really liked looking at the colors around him. 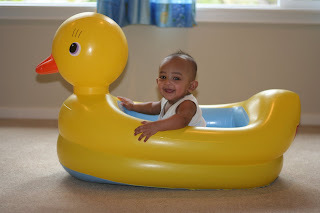 This is the inflatable duck bath tub we bought on Kedaar 6th month birthday. This product is so cute and creative. Kids will love this instantly. Today morning Kedaar got up and being little cranky, then we showed this inflated duck tub to him. He was so excited to see this.Immediately sat in this and played for long time. We will use this tub for his bath from now on. Kedaar completed 6 months today. Time just flies by. Can not believe its already been 6 months since this little baby entered into our world. I made kheer in the morning and made Kedaar taste it :) We took him to library in the evening and got some books for him. We went to Target and bought 2 books(one for colors and one for animals), a cap and inflatable duck bath tub for him. Below are some new things about Kedaar in the past few days. need a play gate kind of thing that could confine him to a certain area. -He is able to sit by himself and balance in that position for 3-5 mins. maximum one spoon and thats it. We still need to practice giving solids. splashing water while he is there. -We bought a rocker for him. But he does not want to sit there for long. He likes to go around and explore everything in the house. -We got some telugu animation VCDs from India. kedaar loves watching those songs.That is the only way to keep him in one place these days.